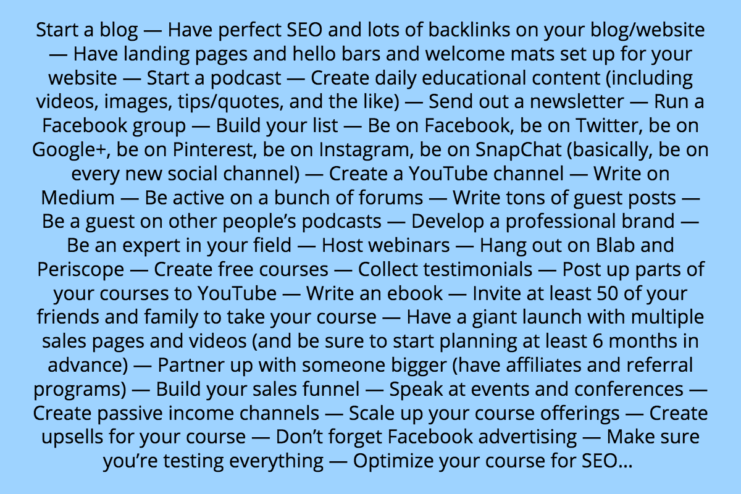 The advice from the so-called “pros” who tell you that in order to successfully market your online course, you need to be using approximately 900 different tactics, or you’re bound for failure! But have you ever wondered why you’re not making progress with marketing and selling your online course, even though you listen to all of their advice? You tried what the top guru told you to do — but it didn’t work. And maybe you moved on to what the next expert was talking about. But… that didn’t work either. Now, feeling stuck, you wonder if it wouldn’t be easier to just throw in the towel, give up, and go back to working for someone else. It would certainly be a lot less frustrating! And maybe you wonder why this is happening to you. But only when you use them at the appropriate stage in your business growth. As I was doing the research for this post, I compiled the following advice from the “experts” about how to market your online course. 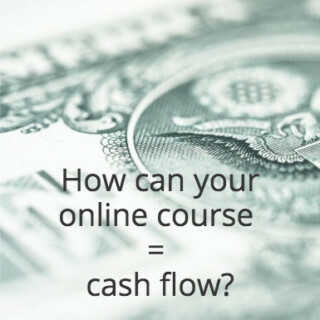 Honestly, it’s no wonder so many people never successfully sell their online courses. They’re too busy “marketing” their course to do any real work! The vast majority of our audience and customers are still in what we call the “toddler” stage of their business, which means that all of those tactics above are just a distraction from the real work you should be doing. So what’s a course creator to do? First, let’s examine what it means to be a toddler-stage business. What exactly is a “toddler-stage” business? Now, believe me when I say that being in this stage of business isn’t a bad thing — it’s certainly nothing to be ashamed of! It’s a natural progression: we join this world as babies, turn into toddlers, grow up into teenagers, and then eventually find ourselves in adulthood. Same goes for businesses. 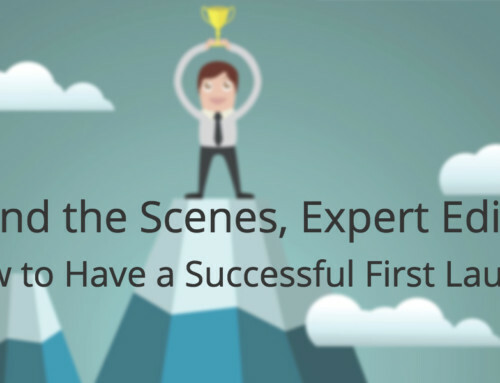 Everyone starts with a business idea, and then progresses through key phases of business growth. But what does it mean to be in the toddler stage of business? You have a small (growing) platform, and you need more people to find you and learn about what you do. You need to ramp up revenue quickly, so that you can pay your bills and build up a sustainable business. 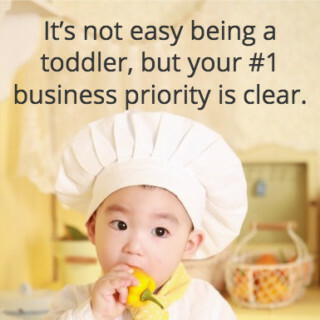 It’s not easy being a toddler, but at least your #1 business priority is clear: cash flow! As the owner of a toddler-stage business, your focus should be on increasing cash flow to a sustainable level. Period. While it might be your dream that your online course will skyrocket you to fame and fortune, there’s a pretty decent chance that all it’s going to do is to distract you from your top priority. Right now, your job is all about relationships. This involves attracting people to you, building relationships with them, and then inviting them to become clients. There are three common mistakes that people in this phase of business tend to make. 1. Trying to build popularity and platform first, before building profitability. It’s certainly an option to build your audience first. With an audience in place, you could build out course or product offerings based on the problems that your audience is having. But that takes a lot of time and effort, and doesn’t bring money in the door right away. And, the truth? The majority of people who try audience building first actually give up, usually long before they reach the point of having a big enough audience to do anything with it. We believe that the quicker (and more sustainable) approach is to build profitability and cash flow first — and then build your audience over time. 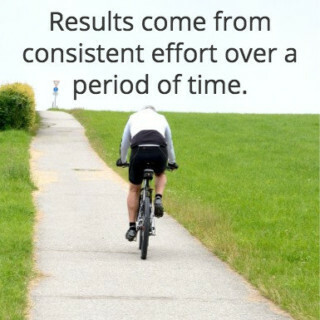 Here’s the reality: results come from consistent effort over a period of time. It might be helpful to think in terms of quarters — what can you focus on over a 3-month period to increase your cash flow? Then, what can you do to get a handful of new clients this month? 3. Failing to choose marketing tactics that fit the current business stage and available resources. This third mistake is so devastating that we want to unpack it in more detail. So many people jump ahead to creating elaborate branded course offerings that mimic what successful people in their field are promoting. Then, they try to build an income stream around that course offering. First, you need proof to show the world that you can help people get results — such as positive testimonials from people whose lives you have changed. Later on, you can build upon those initial results to scale your impact. 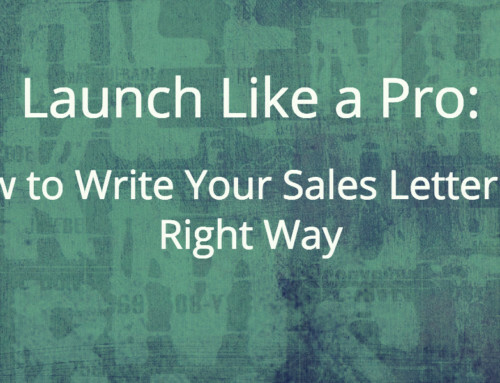 Remember: if you’re launching something, you have to have someone to launch it to. So what is the first step for a toddler-stage business? The key to building a solid foundation for your business at the toddler stage has nothing to do with marketing at all (and nothing to do with your online course — at least not yet). Instead, it’s all about getting new clients. By focusing on your core service offerings (such as consulting, direct services, or coaching) you can give people value quickly, and generate cash flow in the short term. What all of these options have in common is that you’re working directly with a client to deliver specific results that are personalized and customized to their needs. During this process, you’re also finding the “right” clients, and also figuring out who you don’t want to work with. A word of warning before we go any further: it’s not for lack of sophisticated marketing tactics that toddler-stage businesses struggle. It’s from lack of follow-through, consistency, and patience. The first step in the process is to create a simple and consistent approach to gaining new clients — and then to stick with it. 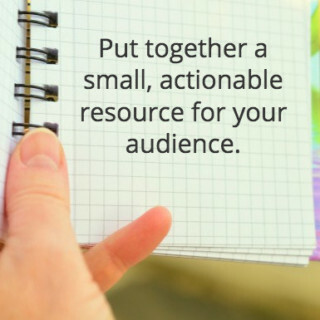 Before you start connecting with your audience, it can be helpful to put together a small, actionable resource for your audience that answers some of their biggest questions or helps them with one of their toughest challenges. This can (and should) be something as simple as a checklist or worksheet that helps them take steps toward their goals. The key is that it’s valuable and actionable — you don’t want them to put it into their “to read” folder and forget about it. Once you have this resource handy, you can use it in a number of different ways. For example, it could be your subscription bribe for anyone joining your mailing list, or you can use it as a followup for people you meet through your outreach. Let’s get started by figuring out how to engage with your target audience. To avoid getting distracted and jumping around – chasing after the next new shiny tactic – you should create a map of what you’re going to do, week by week. Start by creating a simple calendar, or using whatever tool you find helpful to keep track of your list of things to do. Remember, the biggest key to success as a toddler-phase business is consistency. 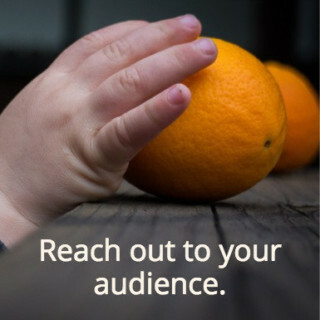 There are three big categories of actions you can take to reach out to your audience. Before you get too carried away, this doesn’t mean joining every social network known to mankind. No — step away from the signup button! Do a little bit of research, and figure out where your target audience is most likely to hang out online. If you have current clients, where do they interact with you the most? If you know people who fit your ideal customer profile, what social media accounts do they have (and regularly use)? Then, use those couple of social media channels to reach out and connect with people. And we mean really connect — you want to do more than just sharing links and random thoughts. Instead, be more strategic in the types of things you post. Write about something that really frustrates you about how things are done in your industry, as the beginning of a discussion about how things can be better. The key is to encourage engagement and invite replies. Then, when they respond to you, you can continue the conversation. Once the conversation is progressing nicely, then you can offer them the worksheet or checklist you created earlier. While social media is great, there’s no replacement for a good old face-to-face interaction. Thinking strategically, figure out what kind of events happen in your community that will give you a chance to meet your target audience face to face. Rather than attending larger general events, go to smaller, more specific ones so that you can get more traction and meet more of the “right” people. You can find events in your area by joining local networking groups, Meetup groups or professional associations, or by paying attention to what conferences and events are advertised on local media. Then after the event, don’t just toss all the business cards you got into a pile. Instead, reach out individually to each person you met at the event — you can also offer them a copy of the worksheet or checklist, if it’s something that you think would benefit them. An often untapped resource is the list of people you’ve emailed with over the years. Often, it can feel like you’re imposing on someone by reaching out, but when done properly, you’re simply offering to add value to their lives. So take a look at your virtual address book of friends, family, and previous email connections — and then make a list of the ones who could benefit from what you’re working on. You can let them know you’ve been working on a new project, remind them that they had shown some interest in the subject in the past, and ask them if it’s something they’re still interested in. If they say yes, then you can send them the worksheet or checklist. As you’re reaching out to people in your audience and starting to build relationships, you should be building a database of names and contact information. Any notes from your interactions. By keeping track of the list of relationships you’re building, you can stay on top of following up with each person, and also track where you are on the path to building toward a client relationship. 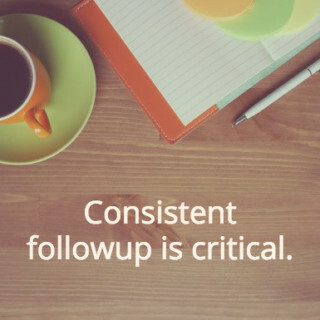 And consistent followup is critical — it shows that you’re professional, but also that you care. One way to build the relationship from initial contact to client is by creating a process that builds upon the free checklist or worksheet. After they complete the worksheet, you could offer them a free 20 minute consultation to talk about what they learned and any challenges that they ran into. Then, if they are still feeling stuck or like they want to learn more, the conversation could lead into an invitation to do some coaching with you, or to take advantage of the services that you offer. Next, we want to be able to track the progress that you’re making. One of the reasons that marketing can feel like such an overwhelming challenge is a lack of measurement. How are you supposed to know how you’re doing if you can’t track the results? If you don’t keep track, you’ll never feel any real sense of progress. It’s really satisfying to track each effort that you make, then see how many people were interested (and ultimately how many of those became clients). 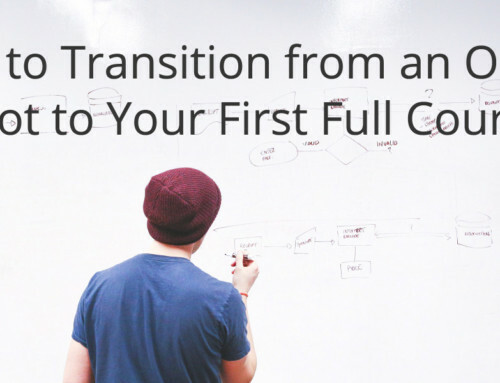 So before you go much further, you’ll want to create a simple dashboard that you will update once a week. You can use a spreadsheet to keep track, or any other software that fits with your business. Social posts: what you posted, the responses, how many conversations were started, any new clients gained from social conversations, and the conversion ratio. Networking: events you attended, any responses to your follow up emails, how many conversations were started, any new clients gained, and the conversion ratio. Direct emails: number of emails sent, any responses, how many conversations were started, any new clients gained, and the conversion ratio. Your revenue for the week. Also, don’t forget to map out the outreach on your calendar — social posts, emails, or networking should all be included and should all be done each and every week. To keep things simple, at the beginning of every month you can map out what marketing tactics you’re using for the next four weeks. Stick to the schedule religiously for the entire month, and then you can reassess. To do this, look at the results from your dashboard, and then you can decide to continue with what you’re doing, or maybe tweak a process or try something a little different. 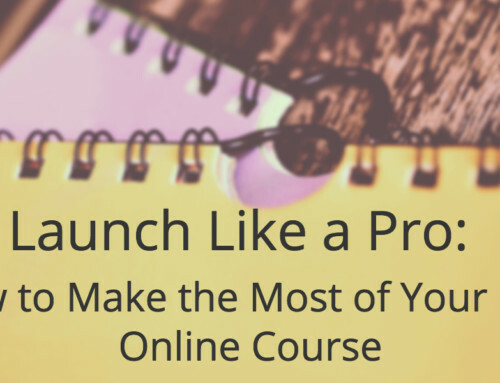 You may be thinking, “How does this help me to market my online course? That’s the whole reason we’re here, right”? Well, now that you have some steady income coming in the door from your new clients, let’s talk about how your online course fits in with your overall business plan. As a toddler-stage business, you’re not in the position to start ramping up a whole bunch of income from your online course right away. That will come as you have more and more satisfied customers, and as you continue to grow your platform. But, there is a powerful step you can take today to increase your cash flow. You can make your coaching, consulting, or service packages far more attractive and valuable by weaving your online course into your offerings. Your objective is to use your online course as a way to give people confidence about working one-on-one with you, while simultaneously enhancing the value that you offer. You can use a free mini-course as a way to give your potential clients a taste of what you have to offer. Using this as a part of a marketing strategy that’s grounded in personal outreach and relationships is important. At this point in your business, your website and content probably aren’t well-developed enough to turn website visitors into actual course participants. You’ll have to actively work to find people who might be interested, and then use a personal invitation to get them into the course. Lucky for you, that’s just what we covered in the sections above! And, once you have participants in the mini-course, this can lead to additional conversations about what’s next, and how you can help them. You will want to make sure that you have a clear call to action that leads from the mini-course into the next step you want them to take. In your toddler-stage business, you’re usually trading time for money. But, you can also use your online course to sell more valuable packages to your clients. For example, you might be tempted to offer “coaching” for $75 an hour. Instead, you could offer a branded 8-week package with defined goals, and include the online course, for $497 per month. You could include articles, videos, or exercises that help your program participants extend their understanding of some aspect of the program, help them apply the coaching more effectively, or simply deepen the benefits of the coaching. And, by bundling all of this together, you can now charge more for the entire package — it’s a more powerful offer, with bigger benefits for your clients (and bigger revenue generation for you). Win-win! There are undoubtedly additional things that would benefit your clients, but that you don’t have time to cover in your one-on-one sessions. You might consider turning the extra questions or additional challenges you hear from your clients (and that are outside the scope of what you usually cover in your sessions) into an online course format. This can be a “bonus” that you add to a coaching package — again, increasing both value and the price you can charge for your time. This helps your clients learn from your experience and techniques, beyond the scope of your sessions. Do you remember that huge list of recommended marketing tactics at the beginning of the post? And do you also remember how completely overwhelmed you used to feel, believing that you were “supposed” to do all of those things to be successful? Now, the next time you read about the next big thing from so-and-so guru to help you market your course, you can smile and keep on clicking — because you’ll know exactly what you need to do to stay on track. By utilizing marketing tactics that are appropriate to your phase of business, you get to clear away the clutter and focus on what really matters. This means that you get to spend your time on a smaller number of tactics, and end up with even better results. By doing more directly relevant work, you’ll start to bring in more regular cash flow, and your business will start to flourish. 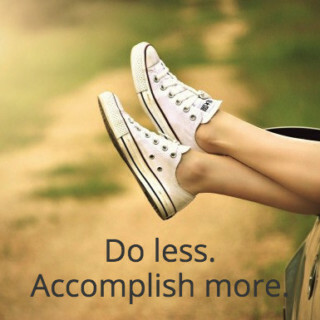 Doing less, and getting more done? Sounds like a win-win! What steps can you take today to free yourself from the tactics that aren’t working for you? And what toddler-stage tactics can you put into place instead? Let us know in the comments! WOW. Thanks for sharing this post. I have been very much in a scattered and overwhelmed mode with my creative juices working overtime. I’ve been missing the focus and clarity that this article points to. It came just in time, as I was asking the Universe to redirect me after a week away from my business. I will go back and re-read, and then read again to get the nuggets. I know for sure that I have not been following up with those who have already signed up for my programs. That is step number ONE! Thank you again. P.S. I love the Ruzuku platform!! That is awesome, Patricia! So happy to hear that this came at just the right time for you. Have fun following up with your program participants! Wonderful information and content is specific and actionable! I will have to read again and take notes and make a to-do list. Thank you. Sounds like a great plan, Bonnie! Thanks for reading. Love all the shares in the blog post, Jessica! I literally couldn’t stop laughing at the blue “to do” box by experts! Such great awareness in your thoughts and take-aways. Thank you for sharing! Thanks so much, Lauren! I’m glad that the list of to-dos made you laugh, too. It’s a little crazy when you make the huge list like that! Love it, Attiya! ♡ Thanks for commenting! Your advice makes a lot of sense to me. I seem to be wasting a lot of time reading about new and different strategies and experiencing overwhelm. Im still trying to figure out my niche. Aside from being passionate about something how does from find a niche?